Vancouver, B.C… Corvus Gold Inc. (“Corvus” or the “Company”) - (TSX: KOR, OTCQX: CORVF) announces the start of its Phase II 2015 drill program at the North Bullfrog Project, Nevada on August 11th. The 8,000 metre reverse circulation (RC) drill program will focus on two main areas 1) Testing new high-grade discovery targets in the large unexplored Eastern Steam-heated Zone; 2) Defining new high-grade systems similar to the recent YellowJacket discovery in and around the large resource areas in the NW part of the property (Figure 1). The program will follow-up on new geologic, structural and mineralization results from the initial spring 2015 phase I drilling program. The phase II drill program will test a number of priority new discovery and resource expansion targets in and around the existing North Bullfrog deposits (Figure 2). Two of these targets were tested in the early 2015 phase I, “proof of concept” drilling program, the results of which have confirmed the key structural and mineralization controls. At the North Sierra Blanca target a northeast trending high level stockwork vein system returned +1 g/t gold intercepts from high level stockwork veining over several meters. This new vein system appears to mirror the YellowJacket zone some 400 metres to the west (NR15-08: July 9, 2015). At the Liberty target which is 500 metres south of the YellowJacket deposit, drilling has intersected a high level quartz stockwork vein system with high mercury values and low grade gold and silver which is characteristic of the tops of the YellowJacket system. Follow up drilling will be conducted at both targets to evaluate these new stockwork systems at depth in the projected productive zones. Figure 2: Geologic map of the Sierra Blanca Area outlining some of the key target areas to be tested in the 2015 phase II drilling program. In addition, a number of other structural/high-grade targets will be tested in the greater Sierra Blanca and Jolly Jane areas including the Air Track/366 target (following up hole NB-13-366 with 20m of 1.03 g/t Au & 17.5m @ 1.26 g/t Au under shallow pediment cover, NR14-01, January 9, 2014) and North YellowJacket (Rhyolite Vein 11.3m @ 3.3 g/t Au, NR14-17: September 4, 2014). The setting of the Jolly Jane is similar to the Sierra Blanca/YellowJacket deposits with two major bounding structural zones on the east and west sides of a large low-grade deposit. 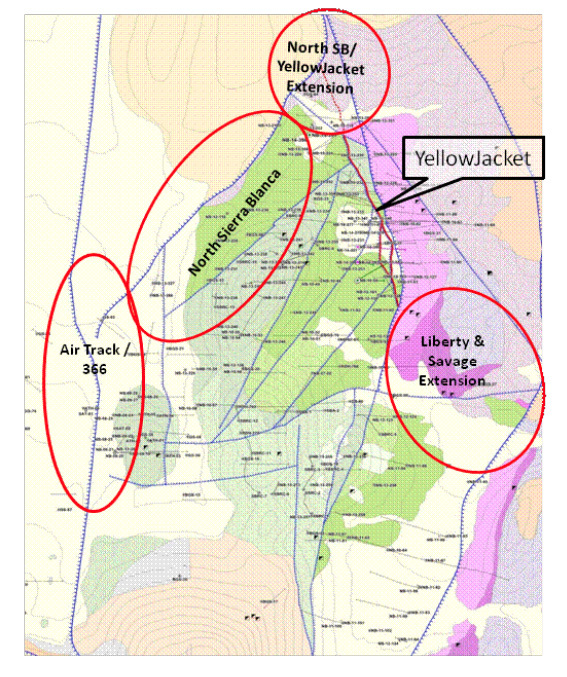 It is believed that these structural zones could host similar high-grade mineralization to that at YellowJacket and will be initially tested in the phase II program. Ongoing mapping and surface exploration has now expanded the Eastern Steam-heated alteration zone to 7 km along strike and approximately 2 km in width. 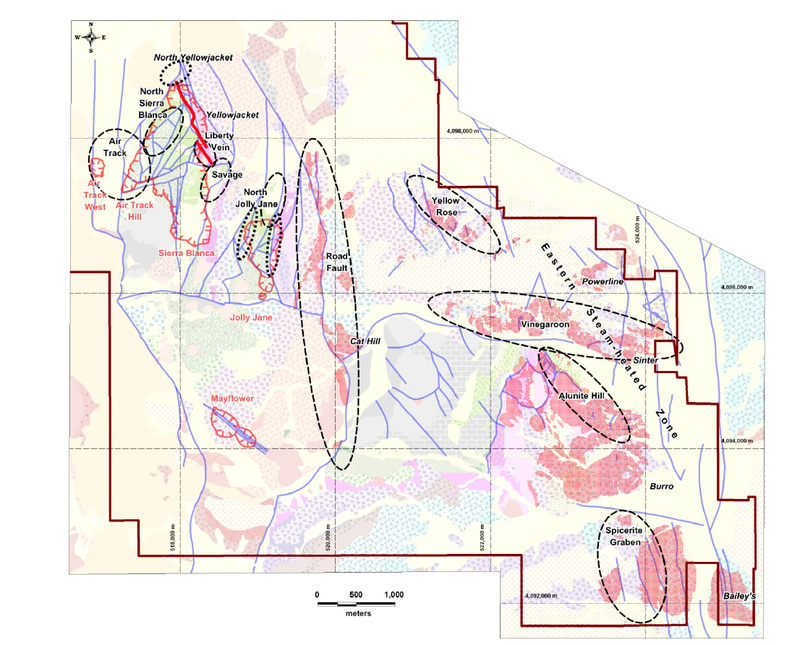 The core of this expanding target area has now been covered with a detailed soil survey with initial results indicating new areas of anomalous gold-silver mineralization linked to the major through going structures (Figure 3). 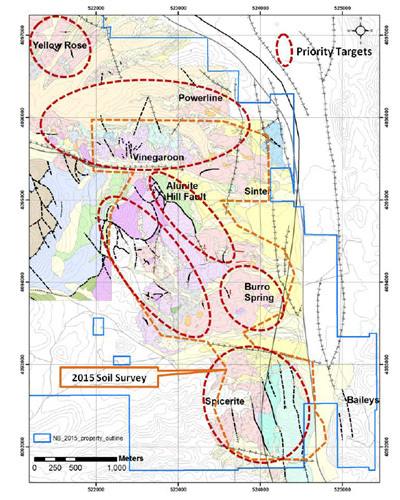 These new soil results will be an important addition to defining the location, scale and priority of phase II drill targets in the Eastern Zone as they link the large highly altered structural zones with potentially productive gold-silver mineralization. Figure 3: new soil coverage for the core area of the Eastern Steam-heated zone. Drilling at the Eastern Zone will start with the initial testing of the first group of target areas including: Alunite Hill, Spicerite Graben, Vinegaroon and Cat Hill. These areas each include several individual targets each with potential to host significant deposits. The Eastern Zone is an exploration opportunity over a District scale system that remains essentially unexplored. Recent exploration work and analysis of the Eastern Steam-heated Zone by Dr. Richard Sillitoe, has refined and enhanced the targeting process and highlighted the potential of the belt in the context of other large productive epithermal belts in the world. Dr. Sillitoe has been an important contributor to discoveries like the Fruta del Norte deposit in Equator, El Pinion deposits in Chile and Cerro Vangardia deposits in Argentina as well as many more. WhittleTM optimization using all cost and recovery data and a breakeven cut-off grade of 0.15 g/t. Mineral resources that are not mineral reserves do not have demonstrated economic viability.